And so, in this round of spectacular comebacks, can Juventus supply us with one more thrilling twist? On the face of things, perhaps the idea of the twice-European champions scoring two goals at home doesn't quite register on your footballing Richter Scale. But when it's two unanswered goals against Atletico Madrid, perhaps the world's greatest defensive side, after being thoroughly outplayed in the first leg, then make no mistake: we're entering the realms of the improbable here. Nevertheless, Juventus have certainly been keen to talk up their chances ahead of tonight's second leg at the Allianz Stadium. There was the promotional video released on Sunday with the theme 'Get Ready To Come Back'. Paulo Dybala quoting Muhammad Ali on his Twitter feed: "The wounds pass, but the desire to fight: never." And perhaps the recent efforts of Manchester United and Ajax have given Juve renewed hope that even the most forlorn of lost causes is worth persevering with. "Last week's Champions League results showed us that it's never over," Wojciech Szczesny argued. "Why shouldn't we believe we can do it?" Then, over the weekend, Juventus wheeled out the big dog. "These are the great nights, the fantastic ones," said Cristiano Ronaldo in a rare interview with the club's in-house TV channel. "The team is confident of playing a great game, and I am too. To the fans I say: think positive, let's believe." It was an indication, perhaps, of the stakes for which Juventus are playing here. For a team that has turned winning the Champions League into a sort of "obsession" - not our words, but the words of coach Max Allegri - defeat at the last-16 stage, even against a team of Atletico's stature, would represent a sizeable setback. At the very least, after two finals in three seasons between 2015 and 2017, it would be increasingly hard to refute the notion that, on the European stage, Allegri's side have gone backwards. And so it's hardly surprising that, in their hour of darkness, Juventus have turned to their record signing, their irresistible force, the man who simply doesn't take no for an answer. These are the sort of games, after all, for which you pay €100m. As yesterday's 'Corriere dello Sport' put it: "He wasn't signed to win the Scudetto or to boost merchandising. Juve are waiting to end years of disappointments." In other words, Juve expects Ronaldo to deliver. The problem is that Ronaldo hasn't really been delivering for a while. Not in the Champions League, in any case. He's scored just once in this year's competition, indeed just once in his last nine European fixtures, going back to last April. Meanwhile, on the domestic front, Fabio Quagliarella's 20th goal of the season against Atalanta on Sunday pushed the veteran striker - at 36, two years older than Ronaldo - into the lead in the Serie A top scorer rankings. All of which feeds into the faint suggestion that at the age of 34, Ronaldo is just ebbing away from his very highest level of performance: still great, just no longer unarguably one of the two greatest. So what's been happening to Ronaldo in Europe? He's still capable of moments of pure inspiration, of course: witness the sumptuous first-time volley against Manchester United in the group phase, or the rasping 35-yard free-kick in the first leg that almost took Jan Oblak into the goal with it. He's still dribbling as much as he ever was, and shooting, too - 6.6 times per 90 minutes, more than in either of his last two seasons at Madrid. But here's the thing: he's finding the target barely 20pc of the time. Almost half of his shots have come from outside the penalty area, where he tends to do most of his work these days. And overall, the impression is of a player still trying to do it all, with progressively diminishing returns. Meanwhile, something else has been happening. Ronaldo's key passing stats in this season's Champions League - 2.4 per 90 minutes - are at their highest level for seven years. With Paulo Dybala and Mario Mandzukic making the running around him, Ronaldo's creative output - his crossing, his link play, his ability to draw defenders out of position - has perhaps never been more integral to his game. Perhaps the real irony here, then, is that the player signed by Juventus as a one-man hurricane, their X-factor in big games, has never been more of a team player. And, yet, it's still Ronaldo. 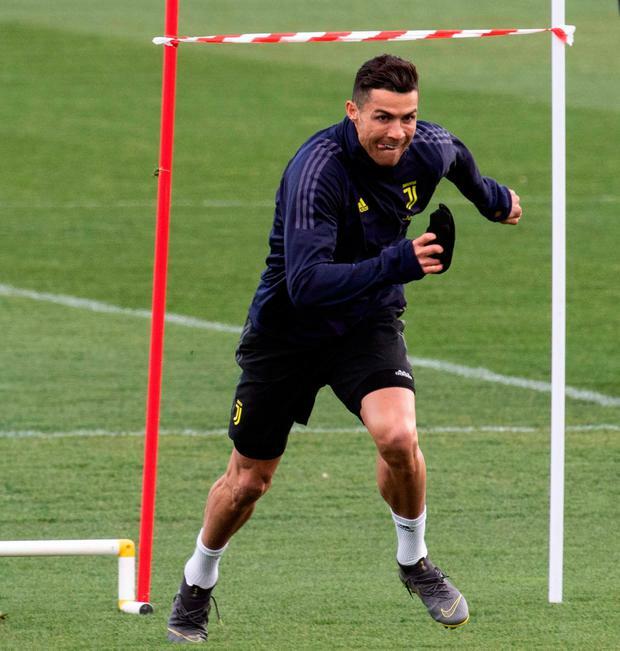 The idea of Cristiano the conqueror - an idea which has shaped European football for a decade and a half - dies hard, and it'll take more than a few blanks to shake that off. Though his powers may be in retreat, there's still nothing he loves more than a stage.